Phew! I just completed one of my first experiments thanks to Elementum Money. 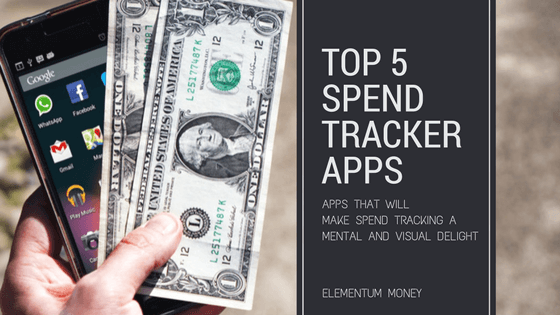 As promised I filled in my exact spends for a month in 5 chosen manual spend tracking apps for a one-month test run. The results are out! It was not easy. Not only is a new (good) habit a challenge in itself, filling in details in 5 of them was another issue. All of them had a different system, different names for categories and very different user interface which honestly required a different mental makeup every time. Another challenge I faced was almost like an accounting challenge. 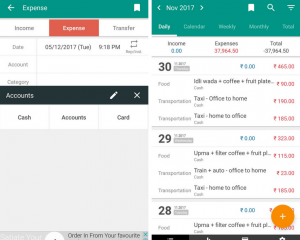 Enough number of times I ended up having some number discrepancy across different apps in the expenses. While the number of errors were generally small in size, I was pretty finicky about that as well considering I planned to use the screenshots for the post. I can definitely say YES, it was. In some ways it was fun. Also, some apps ended up visually showing the data so beautifully that it all seemed to make sense in the end. Unlike other experiences where people are surprised at some of the spend, for me there was no particular shocker per se. I was glad to see that my biggest spend was on things like CFP exam fees and upgrading my WordPress membership. Tracking my expenses every day also played a role in limiting my spending, though it also could end up making me feel a little annoyed at even the smallest of spends as I was now accountable and had to put all of them in. Some rules I followed was that wherever I could, I used 3 accounts to show my spends in cash, Personal credit card and Joint credit card. For every spend on the joint card I put in only half of the spend so that I was putting in only what I was individually spending on that particular transaction. While restricting the categories to give a good visual representation, I still divided eating out into 3 categories – hubby date (considering we end up eating out once every weekend), food ordering (for order-in or takeaway) and social (for eating out with friends/colleagues etc.). Any food bought for cooking was considered in groceries or daily goods which also included any household purchase like cleaning solutions etc. Clearly my least favourite app and whenever I looked at it, I had to literally force myself to make the entries. 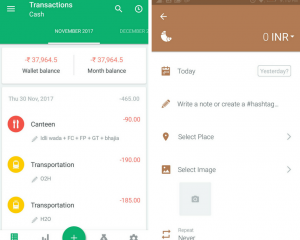 Provision for multiple wallets: The app allows to add multiple wallets which made it easy for me to distinguish spends between cash, personal credit card and joint credit card. 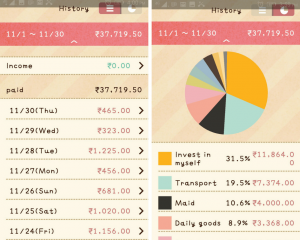 It also allowed to easily check the spends made on any of these or all the wallets together as well. No day-wise transaction bifurcation: In the list of transactions, the entire months’ transactions come together in one long list. There is no bifurcation of days and no way to distinguish spends made on different days. This made it extremely difficult to tally the numbers to those in other apps. While this app wasn’t that big a pain to use, I think the lack of colour and icons played their part in reducing its’ appeal. In all fairness, it was a very average spend tracker. 3 pre-defined accounts: Perfect for my requirement, the expenses could be bunched into 3 pre-defined categories – Cash, Card and Accounts. So, I used cash for cash, Card for expenses on my Personal Credit Card and Accounts for all the spends made on the Joint Credit Card. Data export to excel and csv files: The free version allows you to export and email all your data that has been input into the app as an excel or a csv file. The export gives an option of getting the files in a monthly or an yearly format and looks pretty useful as you can make whatever changes you need to make. Auto complete: Using the history of the data entry made, the app allowed for auto completion which was pretty useful for repetitive transactions. Limited categories: The app comes with 12 built-in categories. 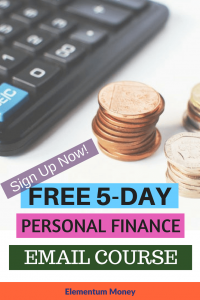 What do you do if your expense doesn’t fit into any of those? Use the 12th category of “Other”. If you want to bifurcate any category, this app does not give you that flexibility. Colourless user interface: This feedback could be due to the fact that I was also testing other more colourful and better apps at the same time. However, the black and white user interface, while being fairly clear was not very appealing to the eye. 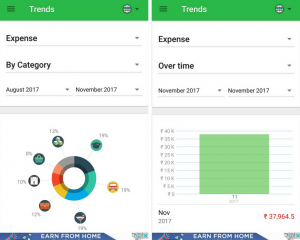 No day-wise trend: In the trend analysis, the app only shows it at a monthly level and there is no option to see the trends at a day-wise level. So, you would need atleast 2 full months data to have any decent trend analysis. A sincere attempt to make spend tracking fun, I thought this could be a useful app to get kids started with this good habit. For me, the app was a mixed bag. Notification bar: This was by far the most useful feature across apps to help remind me to put in the expenses. A simple bar with an “Input button” and a coins icon forever on the home screen was as good a reminder as any. The notification bar was also always on the sleep screen and showed the month’s balance to help you keep on track. 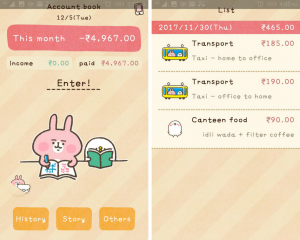 Cute User Interface: For someone who likes Japanese animation or cute kitty, this is a perfect app as it feels like a diary with that theme. Extremely simplistic: The user interface resembles a notebook with each transaction being a page of a notebook. 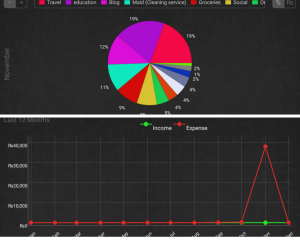 You can clearly see each day’s spends for the month that you want. And they also offer a category-wise pie chart. No data export: There is no facility of allowing export of data through excel of csv files. The app, does though allow you to take a backup, which can then be installed on another device. Silly stories: Every few days I would get a notification of having unlocked a story. It turned out to be pretty silly and incomplete and a 2 slide thing. Honestly, I could have done without the fake emotion of being rewarded. Weird icons: While the app allowed me to create new categories, the icons were, well weird. There were very few appropriate icons that I could find for the categories that I wanted to create. 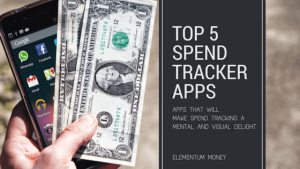 Fundamentally a good solid spend tracker app with a few flaws which end up hampering the experience by quite a bit. Nice Interface: One of the cleanest nicest interface with a lot of parent categories into which you could easily create sub-categories. Large variety of icons: The icons were pretty relevant to most of the sub-categories that you could come up with. They also recently came up with a summer icon pack that you could buy for about a dollar. 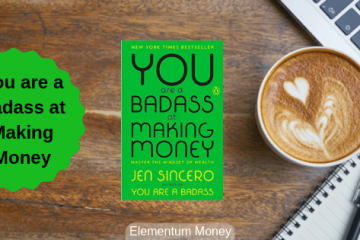 Reminder notifications: If a week went by without my making an entry into Money Lover, there would be a pop-up notification with a gentle reminder to do so. I quite liked that and even the content on it was on the lines of showing love to your money. Provision of separate wallets: You could bifurcate your spends into separate wallets to be able to see your mode of spending. The free version allowed only up to 2 wallets. No data export in the free version: Money Lover needs you to pay up in case you are looking to export your data entered in the app. That was quite a deal breaker for me. 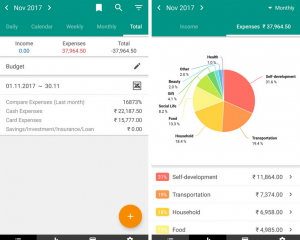 Wallet specific analysis: In the analysis the categories are split across wallets. 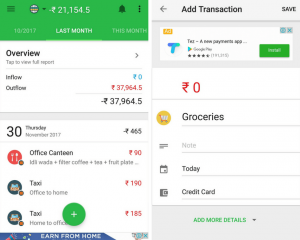 For instance, if you spent on groceries through cash and credit card, then it will show those amounts separately which is sometimes not the optimal way to depict it. Hands down, my favourite app of the lot. While I had used it earlier, it has clearly been completely refreshed and it ticked all the important boxes for me as a spend tracker app. Beautiful user interface: The user interface was clean, brightly colour coded and a delight to work with. 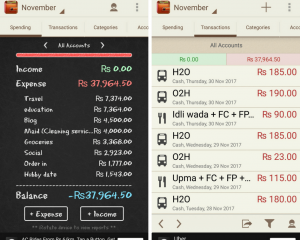 At the time of entering the transaction details, the background colour would change according to the colour of the icon. Large variety of icons: There were all conceivable types of icons available with no concept of parent or sub-category. It was also fairly easy to create any icon that was required. Data export: Even the free version of the app allowed me to export excel or csv file with a custom-decided time period range. 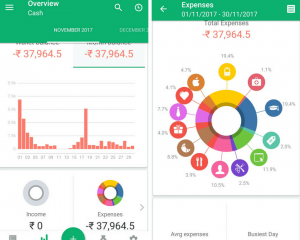 Beautiful analytics: The analytics on the app, be it the pie-chart with the category split or the bar graph showing the day-wise trends, were a sight for sore eyes. 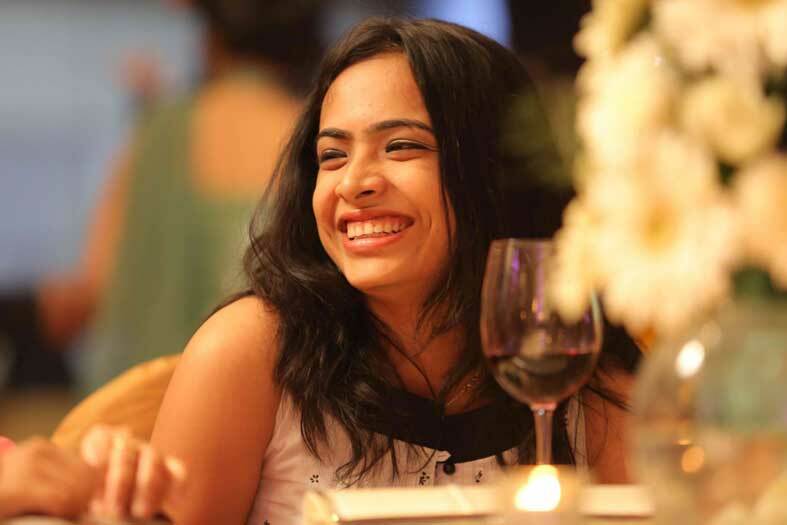 It made me want to continue with the habit so that I could feed in richer data for the analytics in future. One wallet in the free version: The free version allows for only one wallet, a nuisance which I overcame by using the prefix J for joint expenses and the prefix CC for my personal credit card. After using for a month, I definitely see myself using Spendee for the long term. I might also keep Kanahei just for the constant reminder. Rest of the apps were fun for the experiment, but I am sure I am not really going to miss them.